As with your music collection, your TV shows and movies could use some proper organization. 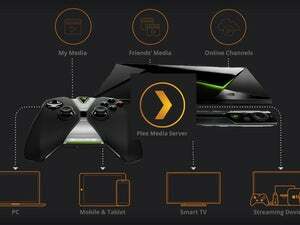 This may be the age of streaming video, but we still like to keep an eye on the Plex Media Server and its various apps for people who prefer to have local copies of their content. 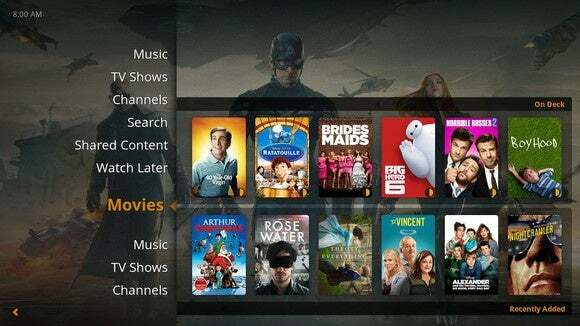 Plex makes it easy to organize any (non-DRM) movies and TV shows saved to your hard drive, and stream them across your devices. Plex works even better when your files are named properly. That’s where a handy little utility called FileBot comes in. FileBot is a very reliable utility that can figure out what content you have and automatically rename it for you to something that makes it easier for Plex to recognize. Now don’t get me wrong, Plex does a great job on its own of figuring out what your poorly named files actually are, but it’s not perfect. Sometimes whole TV shows or movies won’t show up in Plex due to a poor naming scheme. FileBot helps fix that. Once you’ve downloaded and installed FileBot (link above) go to Start > FileBot. Once there, you’ll be confronted with several options. Select Filebot or Filebot (platform). FileBot’s interface is pretty basic but might be intimidating to some. For our purposes, make sure the Rename option is selected in the left-hand navigation bar, which it should be by default. 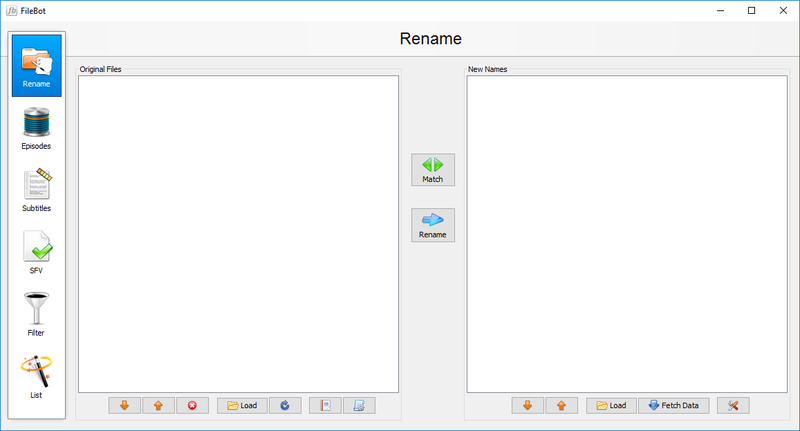 The Rename interface has two panels labeled Original Files and New Names. First, select a folder of content you want to rename. In this example, I want to rename season 1 of Game of Thrones. FileBot brings order to your file-naming chaos. Drag-and-drop the folder containing the video files into the Original Files panel. FileBot will automatically display the names of the files contained in the folder. As you can see in the image here, the file names are all over the place. Some of the files use the season/episode format while others just have the episode name. Chaos. Next, under the New Names panel click the Fetch Data button. A drop-down menu appears with all the various content databases that FileBot can draw data from. For this example, I chose The TVDB. 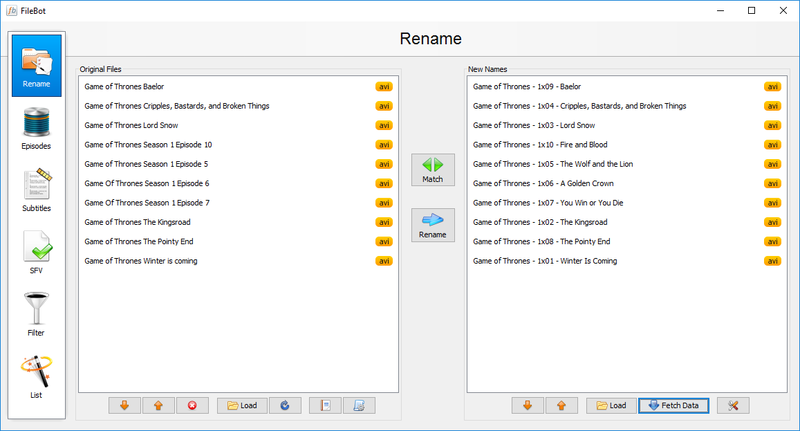 Once you’ve selected your database, FileBot will automatically start matching your files to episode names. When it’s done matching, each file will be tentatively renamed in the New Names panel. You’ll want to scan these results to make sure everything is accurate. If you find a file that shouldn’t be renamed you can remove it by highlighting the file in the Original Files panel and then clicking the red “X” below that. Once everything’s in order, click the Rename button between the two panels, and that’s it. Your files have been renamed. The one thing to keep in mind with FileBot is that it works best to rename files in small groups such as a single season for TV shows. Not only will FileBot respond faster, but it’s easier for you to verify that each change is accurate.